AISIN World Corp. of America (AWA) is not a new company to OE or aftermarket. The parent company, AISIN Seiki Co. Ltd., was founded in 1965 as a manufacturer of OE. Toyota today holds approximately 24% of its property. As AISIN entered the United States market in 1970 the focus was then on the rebuilder market. At that time the rebuilders were very strong and the product that Aisin sold mainly went to those rebuilders, they complement their basic supplies with Aisin products or sell them as new or 'reman' products. 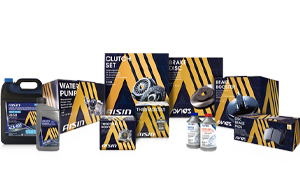 AISIN was limited to the sale of products that include clutches and water pumps later. Eventually the company started selling to repackagers, and many stores across the country have probably used Aisin parts packaged under the brand name of another company.